George Goossen lived a happy life and he died peacefully in hospice at Victoria, BC’s Royal Jubilee Hospital on February 27, 2018, after a very brief illness, with his daughters there comforting him. George was born in Didsbury, Alberta on July 30, 1932, the 5th of 9 children to Maria and Peter Goossen. As a prairie boy, he did what prairie boys do: played hockey in the winter and baseball in the summer. He attended Didsbury School, worked in the local grocery store and spent some time in the militia. Following that he joined the RCN in June 1951 and this was the beginning of a long and interesting career. He was honoured to have been chosen as part of the RCN contingent to the Queen’s Coronation and quite recently organized a reunion of a few remaining contingent members. His career took him to both coasts and Hamilton and Ottawa in between. When he married Colleen Stone in 1959 he was warmly welcomed into the Stone family where he was loved as a brother. His life was enriched with the birth of son David and daughters Stephanie and Tanya. The family enjoyed many camping holidays and trips to the Prairies. George always enjoyed high school reunions and the Stone family reunions. George was a quiet, gentle man who was a well-respected shipmate and a good neighbour who was always willing to lend a helping hand. He was a kind and loving husband and father. With many talents, he could fix almost anything. He was a military history buff and while celebrating his 85 birthday at Vimy Ridge he could share his knowledge with tour guides! 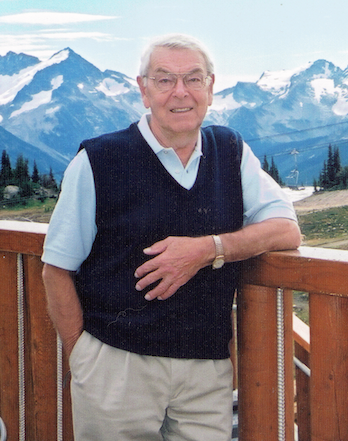 He was a passionate volunteer for the Times Colonist annual book drive where he manned the military table each year! As a father he had few rules: be on time, no food in the car, and caps off in the house! He was always interested in their schooling and sports activities as well as those of his grandchildren. His grandchildren brought a special joy to his life and he loved them equally and unconditionally! Left to treasure his memory are: wife Colleen; son David (Shana), daughter Stephanie (Tony) and daughter Tanya (David); grandchildren Kalli (mom Jill); Ryan, Mark & Eric (dad Rick); Olivia, Lydia and Peter; Maya; Tony’s son’s Kale and Riley; siblings Jacob, Anne, Agnes & Mary, nieces and nephews; and many friends including his very best friends Bill and Murray, the two sailors who married two of Colleen’s sisters. Rest in peace – George, Dad, Grandpa – after a life well lived! And don’t worry we’ll guard the fort! Here is the slideshow of his life that was played at the celebration of his life on Saturday, March 17, 2018.